The storyline was light, but meaningful, for humans of all ages, the lesson taught can easily be understood by even the youngest of viewers. Illumination Entertainment, currently owned by Universal, has released yet another gem, The Secret Life of Pets. Beginning with Despicable Me in 2010, Hop (2011), The Lorax (2012), Despicable Me 2 (2013), Illumination waited two years until released Minions in 2015. Following the continuation of their prior brightly animated, humorous characters, in 2016, they released The Secret Life of Pets, which became a huge hit with people of all ages. The Secret Life of Pets opens with a bang, keeping your interest from the very moment the movie begins until the very end. Max, voiced by Louis C.K. (best known for his writing work on Late Night with Conan O'Brian; The Chris Rock Show), is a dog who loves his human, Katie, played by Elie Kemper (Unbreakable Kimmy Schmidt). While he doesn't quite understand why Katie must leave every day, he has a whole gang of dogs and cats to play with and keep him occupied all day long. That all changes one day when Katie brings home another homeless dog, Duke (Eric Stonestreet; Modern Family), to be part of the family. Jealous to the bone, Max does everything in his power to make Duke feel unwelcome, in trouble, and unloved and Duke treats Max the same, until one day, they both get lost while playing in the park and caught by Animal Control. Max and Duke then go on an incredible adventure together, rescued by a street gang of former pets lead by what strikes me as the Evil Easter Bunny, Snowball (Kevin Hart; Ride Along). Lying to the gang to obtain their help, when Max and Duke are found out, they must do everything in their power to escape, but in doing so, end up far away from home. Luckily, their furry friends from Katie's apartment building have set off to find Max and Duke, and when they all reunite, they manage to make their way home back to their owners and their comfy home life. And, of course, the adventure brings Max and Duke closer together, understanding each other. They can finally learn to share not only the apartment with each other, but Katie's love and affection, as well. I have to echo my colleague's theatrical review when she says that Illumination does everything right. The humor is funny for the younger children, but there is clearly subtle sarcasm appreciated by the adults. Illuminations films have been a success since they started with Despicable Me. They have managed to take what could be a repetitive story and twisted it into something that can become a successful franchise. I can definitely see a spin-off from The Secret Life of Pets, as the writers developed the supporting characters well enough that they are memorable to all watching the film. My eyes almost jumped out of my head watching this Blu-ray. At 2160p, with an aspect ratio of 1.85:1, the details are brilliant and full of life. The colors absolutely pop off the screen, the details impeccably crisp and clear. While other reviews say there is not much difference between the 2k and 4k version, I have to disagree - maybe because I am not used to watching movies in 4k or maybe because the animation, to me, just made the 4k experience so much more impressive. The Dolby Atmos/TrueHD 7.1 (48kHz, 24-bit) is as perfect as you can get. As in most animations, the music is vibrant and lively and in this film, even reminiscent in some parts (think Grease, 1978). In Pets, I could clearly hear the dialogue over the background music without having to adjust the volume. If you've ever read my reviews before, you would know that I love the Bonus Features on the Blu-ray, and in this case, it is no different, except that the Bonus Features are not on the 4k disc, although they are on the Blu-ray 2k version and the Digital downloads. 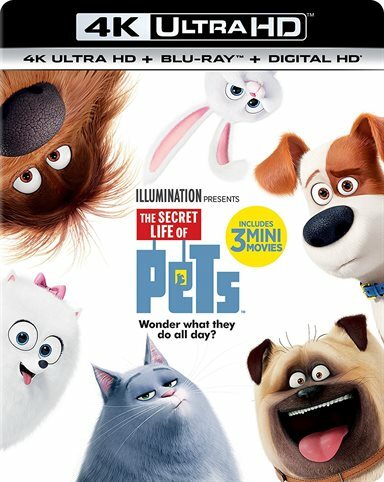 The Secret Life of Pets has so much to offer in the form of Bonus Content, that for the sake of brevity, I am listing out the Bonus Features without too much detail- you will just have to buy the Blu-ray to find out more! All About Pets: Watch Animal Trainer Molly O'Neill help Actors Eric Stonestreet and Kevin Hart get hands-y with some animals. As a fan of Universal, I can only applaud their foresight into acquiring and owning Illumination Entertainment and ensuring that Chris Meledandri continues with every one of the Illumination projects. The storyline was light, but meaningful, for humans of all ages, the lesson taught can easily be understood by even the youngest of viewers, and the plot was deep enough to provide all the necessary background details, but not too much that you were overwhelmed or even itched to glance at your watch during the movie. This is a movie that can be watched over and over and will never grow old. Fingers crossed that there will be a sequel to continue the next escapades of Max, Duke, and their furry friends. Download The Secret Life of Pets from the iTunes Store in Digial HD. For more information about The Secret Life of Pets visit the FlickDirect Movie Database.